Our latest Market Snapshot report for Portugal shows Vodafone continuing to lead download speeds as well as performing best for network stability across the country. Together with Vodafone, both MEO and NOS also show improved upload speed results between November and January. Vodafone continue to lead 4G download speeds across the country, averaging 17.91 Mbps and overtake MEO for 3G download speeds compared with our August - October report. NOS also overtook MEO for 4G download speeds and move into second place, averaging 13.58 Mbps compared with MEO’s average result of 12.95 Mbps. MEO are the only operator whose average 3G and 4G download speeds have fallen for the November - January period, however they do move back into second place in Porto and Setúbal, where they averaged 15.51 Mbps and 13.97 Mbps respectively on 4G. Averaging 9.29 Mbps and 7.72 Mbps on 4G, both Vodafone and NOS recorded improved upload speeds between November and January compared with our August - October report. MEO’s 3G results remained the same, average 2.52 Mbps, as its 4G upload speeds also improved to 6.65 Mbps. NOS place second for 4G upload speeds across the country, but drop to third for 3G where it averaged just 2.38 Mbps and only 1.92 Mbps in Lisboa. 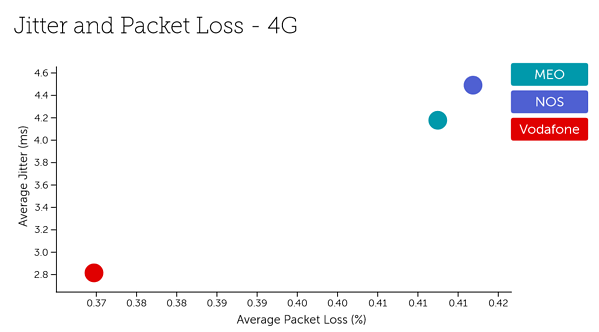 Relative to NOS and MEO, Vodafone demonstrated the best network stability of the group, with the lowest average results for jitter and packet loss on 4G. Both MEO and NOS recorded relatively high amounts of both jitter and packet loss in comparison across the country, with MEO showing improved packet loss recordings in Lisboa and Setúbal, and NOS showing similar improvements in Porto. Our findings for Portugal are based on 4.96 billion network quality measurements including 993 thousand speed tests between November 2018 and January 2019. Our latest complimentary Mobile Experience Report is available to download from the Tutela Insights portal.